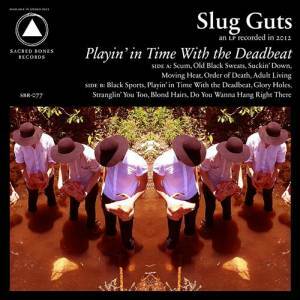 Slug Guts – Playin’ In Time With The Deadbeat | NoCoda. What It Sounds Like: Give credit where credit is due. In an online review, a man named Charlie Quaker describes the third Slug Guts record as “noisy psychobilly with a post-industrial/goth glaze of evil.” I could not, and would not, attempt to explain it better myself. My hat’s off to you, Mr. Quaker. Slug Guts, hailing from Australia, deliver a beautiful mess of dusty, dark, clanging post-punk on Playin’ In Time With The Deadbeat (ok, I did try to explain it a little differently). James Dalgleish’s vocals are barely discernible in a sense of the actual lyrics throughout the length of this record, and his bandmates back him up with an uneasy blend of disjointed guitars and out-of-tune drums. He wails away through the likes of Old Black Sweats, Adult Living, and Black Sports, sounding like a demented spirit that has been stuck in its restraints for too many centuries. The title track breaks into an almost haunted house riff, as the spirits swirl around, in and out through the various doors of the house. More lighthearted in a “Monster Mash” style than in a “Night of the Living Dead” kind of way, but somewhat unnerving in either case. I do enjoy this record, but obviously not for the same reasons that I’m into a big-chorus, catchy hook single. You’re not going to find yourself singing along to anything here. You think a song called Glory Holes is actually going to have a memorable chorus? How could a band that calls themselves Slug Guts know what a hook even is? That is, unless, they’re baiting it with themselves. It’s not stereotypical music for the genre, nor is it completely off-kilter and impossible to listen to (though it may be pushing those boundaries). Like most things in life, it has its time and place. If you’re into post-punk, and you like something off the beaten path, this is certainly worth your time to at least check out.